Meet Daniel Chen, Manager of Project Development, Western Region. I like how Bright Power continues to adapt and innovate our business to meet the constantly changing client needs and incentive program requirements. Combined with working with an intelligent and collaborative team has allowed me to grow my skills quickly. It has given me the opportunity to effectively audit portfolios of properties and implement measures like steam heating controls and occupancy sensor thermostats. I’m proud that I’m one of the few to design and install heat pump water heating systems in the U.S. for multifamily applications. We have now installed a total of 9 systems in 7 different properties – with more to come! I’m helping to install a 150kW solar PV system in Sacramento. I also installed over 40 water heater plants in 2017. Since starting in the West Coast office, I feel my role is constantly changing which has allowed me to learn and develop a holistic view of the business. I’m often required to put on different hats. I’ve been able to use a range of my skills like Auditing, Energy Modeling, Retrofit Installation, and Engineering Design. All while ensuring each project meets the requirements of half a dozen incentive programs across California. Who are some of the clients and partners you’ve worked with? I’ve worked with some incredible clients. That picture of me is from my heat pump water heater work on a Mercy Housing retrofit. I’ve also worked with Equity Residential, AvalonBay Communities, AIG, National Church Residences, LivCor, Bayside Communities, MidPen Housing, Sares-Regis, and MG Properties Group. Providing turnkey design-build retrofits to clients are most beneficial because they result in actual energy and water savings. Our ability to audit, analyze, and execute seamlessly provides a client with a high chance of success in reaching their sustainability goals. It’s also very easy on their end. You’ve worked with innovative technologies like heat pump water heaters on the West Coast. 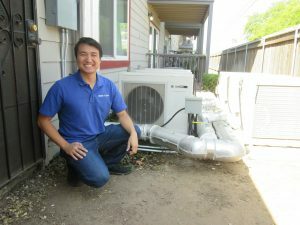 What do you think would help more building owners get excited about using a technology like heat pump water heaters or other new technologies? I think the largest benefit of implementing heat pump water heaters is the ability to electrify your entire property. If you tie in solar PV and energy storage it could lead minimal emissions to net zero emissions for the property. With California’s goal to be 100% renewable by 2045, owners can look to incentive programs to reduce any financial hurdles in transitioning to these technologies.